BJ and Annie Bingham - North Vernon can't imagine using anyone other than Perry's Pool Shop for pool and hot-tub install and services. We regularly have our water tested and it's so convenient to drop off samples in North Vernon. Courtney is a master when it comes to pool chemicals and maintenance. Over the years she has got to know us and our pool. She has saved us more than once after hours or on a weekend when we've had a problem. You won't get that service by going out of town! Perry's is truly a family business that cares for their customers as family too. Dave and Connie Geis - Seymour have done business with Kenny Perry of Perry's Pool Shop for over 20 years. "We have had good service during these two decades. Their staff is knowledgable and helpful with testing pool water and advising on chemical and chlorine usage. When it comes to needed repairs, they work on it until it is fixed and right. We highly recommend Perry's Pool Shop. Jenny and Nathan Ault - Seymour "The first time our wish to have an in-ground pool felt like it could happen was during our visit to Perry's Pool Shop. Kenny Perry welcomed us into his shop and made us feel comfortable. He visited our home and walked the borders of our future pool and learned what we hoped to accomplish. He listened to our concerns and made suggestions from his years of experience. His team installed our pool that same season over ten years ago. We enjoy our routine visits with our friends at Perry's to test our water. They are immediately concerned and responsive during our rare panic moments and have taught us how to care for our pool. Listening to the advice of Perry's team has kept our pool expenses minimal over time, allowing us to spend on important things like the permanent poolside basketball goal Perry's installed a couple years ago, the light saber light up diving sticks our son had to have and our daughter's growing mermaid collection. The Perry's family has witnessed our kiddos grow from these small toys to their first competitive swim goggles and gear. When our daughter's favorite competition goggles broke during a swim meet, Perry's had them in stock, saving her day (and mine). I have recommended Perry's as a pool partner many times and will continue to do so. 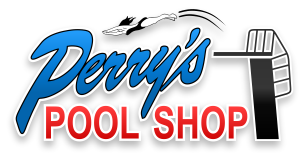 Perry's is the perfect small town pool shop." Toby and Tiffani Calhoun - Seymour say, Kenny and his crew are awesome! The first year we had our pool it flooded from the ditch behind our house (on a Sunday). The liner was falling in and the water was muddy. He heard about it and Monday morning he was at our house working on it before we even called the shop! Anytime we call Perry's, Kenny returns our phone call the same business day. If we have questions or concerns about our water he is always there to help. He has always provided excellent customer service to us and we appreciate him and his crew!